Do I really need a Will? This common question must ultimately be decided by the client, however, each person should carefully consider the benefits of a Will before drawing their conclusion. 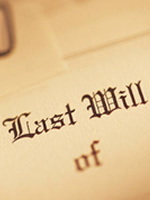 The Last Will and Testament provides each person an opportunity to direct who will administer the estate upon their death as well as where their assets will be distributed at that time. The Will is also an excellent mechanism to identify who will raise minor children in the event the parents predecease their children. It can establish a trust for the benefit of minor children or grandchildren as well as provide a tax planning trust for federal estate tax planning purposes. Anyone who has minor children or who owns real estate or any financial investments should strongly consider consultation with an estate planning attorney to insure the necessary documents are in place to address the administration of their estate. It is also important for individuals to consider a Statutory Durable Power of Attorney (general power of attorney) which can name an agent to administer their finances in the event they become incapacitated. Similarly, a Medical Power of Attorney names an agent to make health care decisions for an incapacitated individual. Finally, a Directive to Physician (commonly known as a “Living Will” or “Advanced Directive”) is an opportunity for each individual to leave a written communication to both family and doctors regarding their own intentions for end of life medical treatment. We commonly refer to these four documents as the four cornerstones of estate planning. They are important for each person’s consideration and review.